View Talay 5 C & D is situated on a prime plot of residential land between Dongtan Beach and Thappraya Road in Jomtien. The strategic positioning of this project cannot be over-emphasized as one has direct access to the baht buses alongside Thappraya Road and direct beach access to Dongtan Beach by virtue of a private key-card security gate. Residents have right of access to the project via a private road which is shared with the luxurious “Avalon Beach Resort”. Whereas the project itself is comprised of 1,968 units ranging from 48 square meter studios to 145 square meter, 1 bedroom corner apartments spread across 2 high-rise buildings of 22 (Building C) and 21 (Building D) floors respectively. Both buildings feature an impressive array of facilities such as a ground floor swimming pool and pool restaurant serving both Thai and Western cuisine together with several commercial shops such as laundromats, Thai massage parlors and convenience stores. Access to the pool is by virtue of the ground floor hallway corridor via the commercial shops which are restricted to the ground floor. Other amenities include both a covered car-park, with controlled access as these are privately owned as well as an outdoor communal car-park with plenty of shade as the outdoor car-park is surrounded by mature trees and lush tropical landscaped gardens together with 24 Hour security and CCTV cameras. Each building has the added feature of 2 high-speed passenger lifts as well as 1 dedicated high-speed goods and service lift, plus a hotel-like car access ramp and drop off point with either stairwell and/or wheel chair access to the main lobby and reception office. Bolstered by the unprecedented success of their first project “View Talay 1” back in 1997, the Developer namely View Talay has since gone on to build “View Talay 2” back in 2002 and “View Talay 3” in 2006 before completing “View Talay 5” in 2007. Despite the Developers rather unimaginative usage of project names, they’ve nonetheless strived to make constant incremental improvements in each and every successive project as they’ve learned important lessons along the way which is quiet admirable and partly explains why they’ve managed to generate a loyal and ardent fan base along the way. As was the case with their past projects, the units within “View Talay 5” were originally sold as shells, with the first time buyers then having to decorate their individual units themselves with the possible exception of the bathrooms which were pre-done, although many opted to decorate these as well. The net result being that no two units are the same, so there is a fantastic degree of individuality within these buildings. 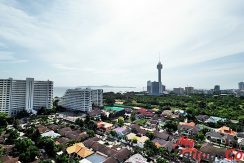 Once “View Talay 5” was completed the Developer then went on to build “View Talay 6″ in central Pattaya next to “Central Festival Shopping Center” back in 2008, “View Talay 7” in Jomtien back in 2010 and most recently “View Talay 8” alongside Jomtien Beach Road in 2011. Large ground floor communal swimming pool surrounded by lush tropical landscaped gardens. On-site pool restaurant together with His and Hers change-rooms with showers. Ground floor commercial shops with a wide array of convenience stores, laundromats, hair salons, restaurants and massage parlours. A separate lobby, reception and juristic office in each building. 2 High-speed passenger lifts & 1 service lift in each building. Open air car and motorcycle parking. Covered privately owned car-parking with restricted access via a security boom. Direct beach access to Dongtan Beach via a private walk way alongside “The Avalon Beach Hotel” and key-card activated security gate. Hotel-like elevated ramp and drop off point. 24 Hour security with key card access and CCTV cameras in the lifts and hallway corridors. Originally sold through the Developer as shells i.e. no floor tiles, air-con, kitchen, wardrobes or individual furnishings each individual unit has it’s own unique style of decor. At that time, one had the added option of buying multiple adjacent studios and combining them into either 1 or 2 bedroom units. The bathroom(s) were fitted as standard with a grey granite sink counter-top, vanity mirror and shower, however most were upgraded at the discretion of the individual owners. Pattaya-Jomtien Baht Bus Route alongside Thappraya Road: 30-Seconds (Walking). Suvarnabhumi International Airport Link Pattaya Bus Terminus: 3-Minutes (Walking). Pan Pan Italian Restaurant and Frasers Aussie Bar and Restaurant: 4-Minutes (Walking). Jomtien Fruit & vegetable Market and Soi 5 Immigration Department: 2-Minutes (Car). Tesco Lotus, Outlet Mall and Thepprasit Weekend Market: 6-Minutes (Car). Royal Garden Shopping Centre and The Avenue Mall: 12-Minutes (Car). Pattaya Beach & Central Festival Shopping Centre: 13-Minutes (Car). Pattaya Memorial Hospital: 14-minutes (Car). Phoenix Country & Golf Club: 25-Minutes (Car). U-Tapao International Airport: 40-Minutes (Car). View Talay 5 C & D was completed back in 2007. Building C No. of Floors: 22 Floors. Building D No. of Floors. : 21 Floors. No. of Units: 1,968 Units. Maintenance Fee: 7,000THB Per Unit Per Year (Ongoing) Payable 1 Year in Advance.